The dynamic of world politics, people and cultures is indeed fascinating. We spend a significant amount of time trying to understand the vast diversity of living creatures on this planet, but don’t seem to spend near enough time trying to figure out how we ended up with such a diversity of intelligent creatures who consistently end up at war with each other or at the least threaten each other’s livelihood’s by whatever means at there disposal. It’s not an easy answer to resolve and throughout history we watched a few successes where countries have turned from dreams of world conquest to world cooperation and others that have consistently stood on the side of tyranny and oppression perhaps none more so than North Korea. Technically, North Korea is still at war with it southern neighbor. However, South Korea is an example of what a country can do when it embraces openness, entrepreneurship and a spirit of individual expression and freedom. The South Korean economy thrives and is a financial success and technological leader. North Korea however is a closed society with a dictatorial ruler and can barely feed its people much less offer it resources to the world. Another consistency with countries that stand on sides opposite to the Western democracies is the tendency to resort to a military buildup and to advance weapons of mass destruction. That brings us to where we are now. Sitting on a launch pad in North Korea is a three-stage Taepodong-2 missile purported to test North Korea’s ability to put a satellite in orbit. In the early days of the American and Russian space program the only difference between an intercontinental ballistic missile and a manned rocket was the payload. I’m generalizing here – the statement is true although some modifications were made to “man rate” the vehicles, but my point is the same technology is used for both. In the case of the Americans and the Russians the quest to perfect a ballistic missile came first then utilizing it to put satellites and humans in space was a byproduct. For countries like North Korea and Iran such a development is not permitted. The world would not sit by and watch radical regimes build weapons that could wreck havoc on neighbors and other targets around the world. With a three stage Taepodong-2 missile poised on a launch pad in North Korea we sit again in a position similar to the launch of the Iranian satellite. It should be noted that the Iranian launch vehicle is a direct derivative work of the North Korean rocket. It is North Korean technology. Iran has worked closely with North Korean to purchase hardware and technical expertise to assist with their program and will be on hand to watch this launch. Under the guise of a space program both countries have developed a launch capability that could reach countries with which both have had longstanding feuds. North Korea’s rocket if successful could hit American soil in Alaska or Hawaii and if the payload were lightened even the West Coast. Of course, such a blatant attack would be foolish and the retribution would be so great that even radical regimes like North Korea and Iran wouldn’t risk their nation’s existence for a one-shot attack. However, much like my previous writing on Iran’s launch the ability for North Korea to commit a “terrorist” act is not limited to delivering a warhead via a rocket. The greater threat is that these capable, but relatively unsophisticated rockets will be used as the equivalent of a “roadside” bomb in space. As we’ve seen from the Iranian launch the maximum altitude is exactly the operating parameter of the Space Shuttle and the International Space Station. An anti-satellite mission under the umbrella of a “test” or merely the “accident” of a fledgling space program or even for defense purposes would be similar to tests by the U.S. and the Chinese. It would be a difficult “crime” to enforce given that other countries have done the same without any punitive actions. As we’ve seen, the Shuttle and the ISS recently had to dodge space debris that were remnants of the Chinese test. Such an act by North Korea could be highly disruptive to peaceful operations in space and could endanger the lives of all humans operating in space and the hardware they utilize. The opportunity is to act now. North Korea and Iran shouldn’t be allowed unmonitored access to put vehicles in space given their cloak of secrecy, outspoken aggression and pursuit of destructive intentions towards those that stand in their way. Under international supervision and monitoring North Korea and Iran can enjoy the peaceful usage of space for exploration and advancing technologies can benefit their people. Without supervision it can only be assumed that North Korea’s motivation is something other than stated and the use of ballistic missiles or anti-satellite capabilities is the true intent. 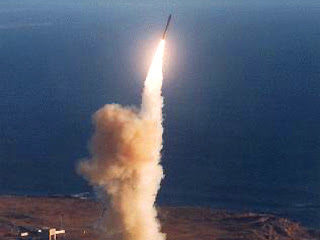 It seems unlikely that Japan or the United States will shoot down the North Korean rocket attempt. Given that this rocket has not had a successful launch yet by the North Koreans and has suffered from structural failure makes a mishap during launch or an “accident” in space not out of the realm of possibility. If we do shoot down the launch attempt we will have set a precedent that all launches from “Axis of Evil” countries will not be permitted unless they are monitored and cleared by an international governing body. It would also create another regional conflict that would involve the Koreas, China, Japan and the U.S while almost certainly bringing in Iran and the Middle East conflict and large players like Russia and China would likely fall on the side of the Axis and not the Allies. There are no easy answers to these problems, but one thing is certain. Countries that will risk all to inflict loss of life and pain on their ideological opposites are truly dangerous and cannot be allowed to progress in the development of weapons to wage war on a more horrific scale. We’ll all be watching this week at the planned launch takes place and we’ll all be waiting to see what steps will be taken to ensure that North Korea’s use of rocket technology isn’t a threat to anyone.